It's August and we're still revving up the RPMs on our Porsches as we continue to enjoy a full slate of activities. In this issue, you can read about several of the activities that members enjoyed in July -- an action-packed month for sure -- as well as our most recent event on Aug. 1, the Show and Shine. Several members went to Porsche Parade in St. Charles, Ill., and others took in the Kohler International Challenge with Brian Redman at Road America on July 17. Read recaps of those events in this issue and also read about the activities that are still coming up. Some are right around the corner so please make plans to join us. Aug. 5 - Board meeting at Brew City Grill in Mequon. Members are always welcome to pull up a chair, enjoy a beverage or supper and listen in to the board's discussion of club business. 10250 N Cedarburg Rd., Mequon, WI 53092. Brew City is on Hwy 57 between County Line Road and Donges Bay Road. Aug. 8 - Drive to Botham Vineyard, Barneveld. This will be a group drive (follow the leader style) from Lake Mills (starting point) to Barneveld, west of Madison. The destination is Botham Vineyards, the site of an annual vintage car show. Details here. Aug. 15 -- Evereything Porsche 50th anniversary autocross. Come out and drive the course to see what autocross is all about. Novice runs will take place in the morning. You must be on site early to walk the course with instructors and attend the drivers meeting if you want to do the free novice runs. We also offer a catered picnic lunch. Bring your own lawn chairs. If you want to enjoy the catered lunch, you must RSVP and send in your payment for your lunch by Aug. 11. Download the RSVP form on this page which also includes the picnic details. If you are not interested in the catered lunch and want to bring your own lunch or just stop out for the free trial runs, you are welcome to do so but you must let Autocross Chair Bruce Tammi know by Aug. 11 if you plan to do the free trial runs as a novice. Be sure to check the Autocross events page for details on the day's schedule. Those who do the novice runs in the morning are welcome to participate in the timed afternoon runs. Fee applies for the afternoon. 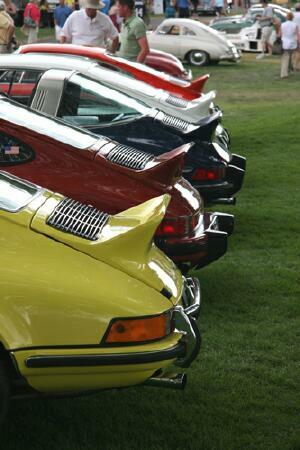 Sept. 25 - Everything Porsche 50th anniversary banquet at the Wisconsin Country Club. Invitations will be mailed to all members in August. This event will feature a multi-course sit-down dinner, silent auction and guest speaker Burt Levy, well-known motorsports journalist and author. Help us cap off a year of celebrating the region's 50th year as a chartered region within Porsche Club of America by attending this event. Bring your Porsche as we will be parking our Porsches in front of the Country Club to create a dazzling display of motor car excellence. Brian Redman was a special guest at Porsche Park in Road America, thanks to Ron Pace and Kohler Co. Brian told great stories of his days as a Porsche factory-sponsored driver. Later in the day, several members headed to town, Elkhart Lake, for an early dinner at the Lake Street Cafe and then enjoyed the on-street concours d'elegance sponsored by Road & Track magazine. The concours is one of the largest and most spectacular in the U.S. See a photo album here of the activities in Porsche Park and on the streets of Elkhart Lake. Photo album here. More than 50 cars filled the parking area at International Autos Porsche-Waukesha for the region's Everything Porsche Show and Shine and friendly concours d'elegance competition on Aug. 1. See who the winners were and check out several photos of this Aug. 1 event. Story here. The Milwaukee Region welcomes these new members who joined us in July. We look forward to saying hello at an event in the near future. Congratulations to these members who are observing a membership anniversary with PCA in August. Porsche factory video -- the making of a 356. Watch the video here. Thanks to Rick Zinda for forwarding the link. 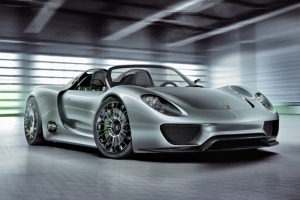 918 Spyder given green light for production. Read the news release here. Porsche stepping up research on electric cars. Read the news release here. Check out the classified ads here. This is a free service to members. Advertise your Porsche-related items. Details on how to submit an ad are on the classifieds page.